Not an Apple fan - though I like the iPhone, the iPodTouch and the macbook - this notebook has (and still) served me right. I use it as a front end to our work HP mainframe, when traveling and for simply multimedia works. I have thought many times of upgrading it to the latest model of this series, but in the end, this macbook still holds its performance and yet to let me down. Would I buy another macbook in the future? The answer is a definitive YES. Apple's MacBook Pro 13 is essentially the older 13-inch MacBook aluminum MaBook system redesigned with some of the features found in the larger MacBook Pros. This is for the most part a benefit to consumers as the price tag for the entry has remained the same at $1199. The aluminum body provide it with a very stylish and durable exterior. This combined with its solid performance and features make it a great laptop for those looking for a highly portable but fully featured laptop. At the end of last year, Apple updated its Macbook range of laptops, giving them a shiny new aluminium design so they looked very similar to the company’s more expensive Macbook Pro models. The new design was attractive but the new models were considerably more expensive than the original white plastic ones. Amid the recession, Apple decided to keep the old white plastic Macbook on sale as well, in order to provide a less expensive alternative. A welcome update that improves performance, battery life and value. Small but mighty. The 13in Macbook Pro is certainly a very solidly designed notebook that proves it has more than just looks. Small and portable, it makes for a great all around package for web surfing, video-editing and photo management. The most notable overall improvement to the new Macbook Pro is its long-lasting battery life, which significantly increases its usability when you’re out travelling and saves you the trouble of having to charge every so often. 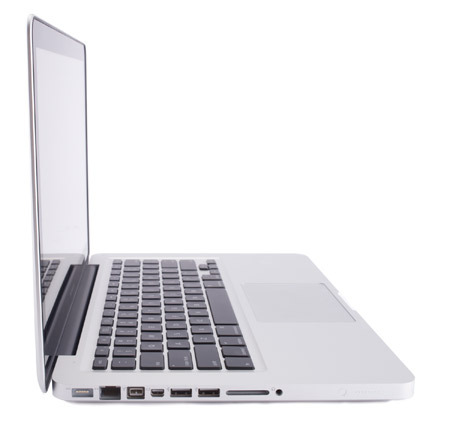 While minor, the inclusion of a backlit keyboard, SD card slot and Firewire are fine additions that make the overall experience more enjoyable. Although the unibody design is sleek and attractive, the original Aluminium MacBook definitely looked over-priced when compared to its white plastic counterpart. Apple has clearly acknowledged that mistake with this update, as the improved performance, battery life and lower pricing certainly offer better value for money. The £899 model will probably be the big seller, but both models will satisfy the clear demand from Mac fans for a 13in addition to the MacBook Pro range. What an update! The new features and benefits that were introduced back in January for the top-of-the-range 17-inch model have filtered down throughout the MacBook Pro range (a line-up that also now includes the newly promoted 13-inch unibody MacBook). Yet prices have gone down, making the new MacBook Pros excellent value for money. Suffice to say, a solid performance increase coupled with a significant price drop can only be welcomed. The 13-inch MacBook Pro takes an already excellent machine and moves it a step further along. It satisfies the cries of those who last time around lamented the loss of FireWire. In its place we now have a non-replaceable battery, which no doubt will be a concern for some. 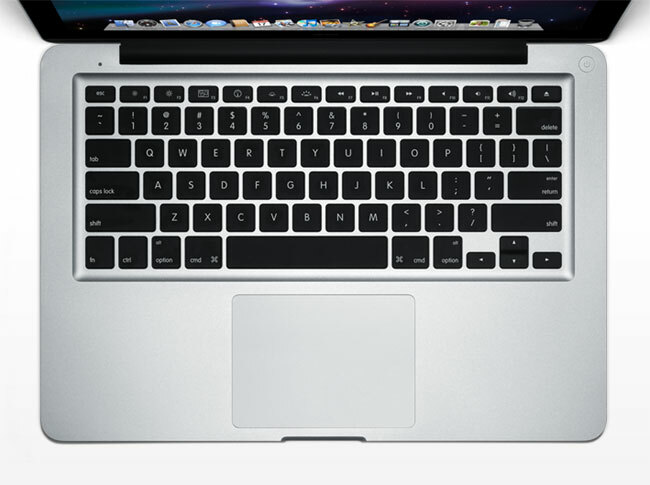 But overall, Apple are continuing a great trend with their MacBook Pro line. The quality of build is excellent, little details like the external battery LEDs and the pulsing sleep indicator bring a touch of class. Sure, you pay more for a Mac than you would for the same hardware in a PC, but you get a lot for it and we think it is worth every penny. Mac-haters will no doubt point out that there are cheaper Windows laptops available – not to mention countless Windows netbooks – but that’s missing the point. Apple’s intention with the MacBook is to offer a laptop powerful enough to handle a spot of video-editing and other multimedia work, at a price that will appeal to consumers. On that score it succeeds. Admittedly, the redesigned 13in MacBook Pro looks mighty tempting if you’ve got the extra spare cash, but the MacBook remains an attractive entry-level Mac OS X system. Non-user replaceable battery aside, it's difficult to find fault with the new 13in MacBook Pro. All the things that made it great in the first place remain, but they've been joined by highly desirable features like the FireWire port, SD card reader and the now standard backlit keyboard. Add-in outstanding battery life, a faster CPU and a slightly more affordable price and you've got a package well deserving of a Recommended Award. 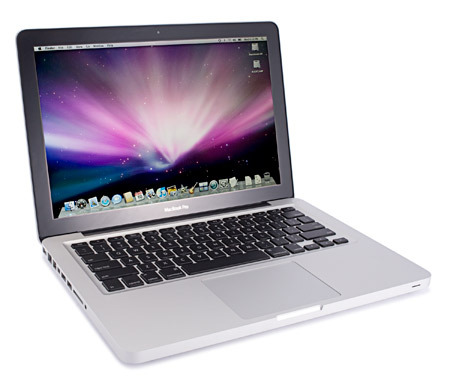 When we reviewed the aluminum MacBook back in October 2008, those MacBooks posted performance scores that were very similar to the 15in MacBook Pro that was also released in October 2008. At that time, the differences between the MacBook and MacBook Pro boiled down to features. Now, with the new MacBook Pro line-up, the features on Apple's latest 13in aluminum laptops have been brought up to equal those found on the new 15in MacBook Pros. With its lower price, the return of FireWire, longer battery life, better looking display and a new built-in SD Card slot that you can boot from, the newest member of the MacBook Pro makes an impressive debut. 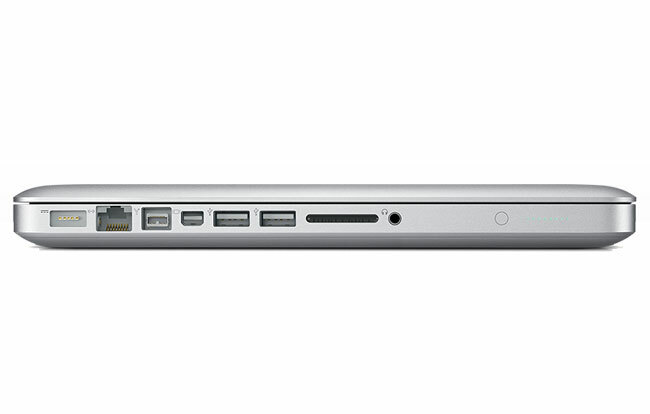 Apple's 13-inch laptop sees the return of FireWire. With its lower price, the return of FireWire (woo-hoo! ), a better-looking display, and a new built-in SD Card slot that you can boot from, the newest member of the MacBook Pro makes an impressive debut. But check back and we'll update this story with a full review as soon as we get results from the PC World Test Center. The screen's way nicer. Apple lists the specific improvement as a 60 percent higher color gamut, but unless you're getting in there with a colorimeter and a monocle what you'll really notice is that Apple's finally shipping a mainstream 13-inch laptop with a viewing angle wider than a pencil. Compared to the disappointing MacBook screens we've seen in the past, the 13-inch Pro display is quite impressive -- we'd say it's roughly equivalent to the panel in the 15, and slightly better than the panel in the first-gen MacBook Air we have on hand. Of course, you're still stuck with that mirror-like gloss finish, but at this size and price point you don't have a lot of matte options regardless of manufacturer. The new 13-inch MacBook Pro has many strengths that make it a good notebook you should consider buying. It gets excellent battery life while running OS X, it can game on integrated graphics, its screen looks excellent, and it has fantastic build quality. With that said its all-aluminum design causes heat to be quickly transmitting into your skin acting as a huge heatsink, driver support inside Windows isn't the best, and the sharp edges of the palmrest can be painful to lean your wrists across. For its intended market most people won't care about the Window's driver problems and the substantial increase in battery life from the previous model is worth the internal battery. Overall if you can get past some of its design quirks it is a great notebook with a feature set that is hard to beat. There are still a few items on our 13-inch MacBook Pro wish list -- a matte screen, mobile broadband options and a Blu-ray drive, for example -- but Apple has made some significant additions. By offering more features for less money, the 13-inch Pro remains one of the most universally useful laptops available. Apple’s latest thin-and-light notebook features strong graphics performance, a stunning display, and more than 6 hours of battery life. Unlike its 17-inch sibling, the 13-inch MacBook Pro does not sweep its weight class in every category. There are cheaper notebooks with weaker performance and much longer battery life, for instance, as well as similarly priced systems with slightly better graphics punch but shorter battery life. 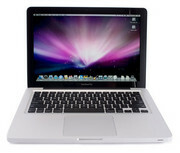 Nevertheless, the $1,199 MacBook Pro offers the best combination of performance, endurance, and smart software. Radically overhauled last year, Apple's MacBook line of laptops moved to aluminum construction, edge-to-edge glass over LED displays, and oversize multitouch trackpads (with the exception of the lone $999 white plastic model). The latest round of updates is more of a refinement than another revolution, but it adds some much-sought-after features, while lowering prices on many configurations. Previously known as the MacBook, Apple's basic 13-inch aluminum unibody laptop has been promoted to the "Pro" series, all while adding features and cutting the base price. After all the whining, the bickering, and the constant remarks about how Windows-based laptops have this and that and cost so much less, Apple, a company known to make its own rules, is finally letting down its guard. 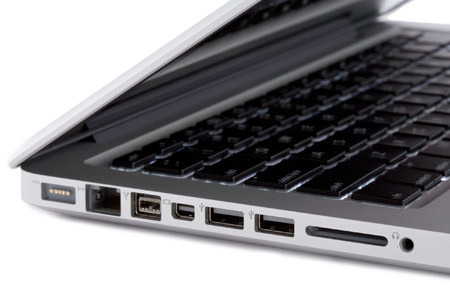 The lovable MacBook Pro 13-inch (now with the "Pro" moniker) has brought back the FireWire port, lowered its price, and for the first time in the company's history, added the elusive SecureDigital (SD) slot. Bringing in an SD slot and bringing back the FireWire port—while also lowering prices—eliminated Apple's weakest links in the 13-inch MacBook Pro. Add bigger, better battery life and you've got yourself a winner. With its superb battery life, good performance, stylish design, and top-notch display, the 13-inch MacBook Pro is a welcome addition to the line. Though 3G wireless users may lament the loss of the ExpressCard/34 slot, the SD-card slot is likely to get used by a much wider range of MacBook Pro owners. Add the ability to easily swap between Mac OS X and Windows, and you have a unique and flexible laptop that packs a lot of versatility for a thin-and-light notebook. NVIDIA GeForce 9400M (G) / ION (LE): Integrated (shared Memory) graphics adapter. Built in in current MacBook, MacBook Pro, and MacBook Air laptops and also used in the ION (LE) platform for netbooks. Also called GeForce 9400M G. Fastest available motherboard GPU (in 2009). Integrated PureVideo HD (VP3) video processor to decode HD videos with the GPU. Only some 3D games with very low demands are playable with these cards. » Further information can be found in our Comparison of Mobile Graphics Cards and the corresponding Benchmark List. Middle class dual core CPU with a TDP of 25 Watt. For high end gamer the performance could be not sufficient (for class 1 graphic cards). 82.96%: This rating should be considered to be average. This is because the proportion of notebooks which have a higher rating is approximately equal to the proportion which have a lower rating.